If you’re looking for a simple way to manage your cryptocurrencies, you’ll find it is quite challenging to find the app for you. Most existing apps have complicated features, have not been designed with simplicity in mind, and—weirdly—don’t even focus on privacy. They want to solve all the problems for everybody, and for both iOS and Android—which usually means a sacrifice in user experience. That’s why we started working on Zenith Portfolio. We wanted to build a simpler, better, safer home for your portfolio. Not for people who trade currencies every day, but for you—who does this as a hobby. You don’t want to miss out. You’ve bought 3–5 coins and want to HODL. You don’t care about speculating. We designed this app for you. 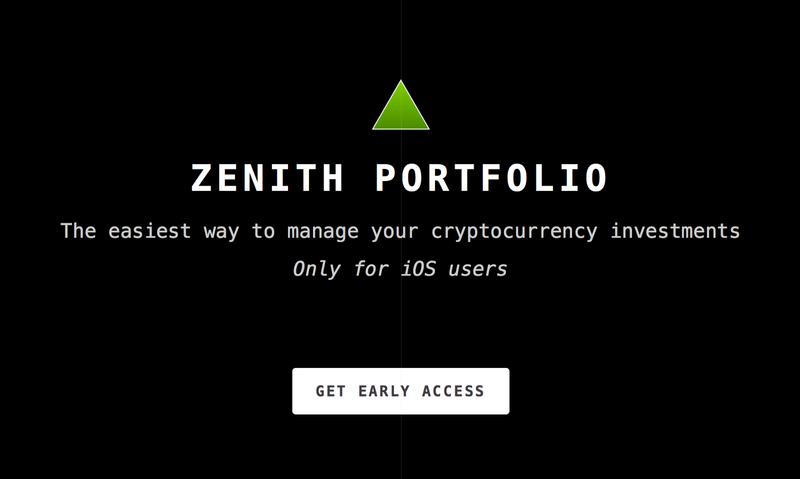 Introducing Zenith Portfolio — the simplest way to manage your portfolio. The Watchlist: A simple way to track how your favourite coins evolve. Want to know how much BTC is at any time? Want to follow that new token your friend has been telling you about? Just add it here. The Portfolio: A simple way to track your holdings, i.e. what and how much you own of a given coin. Again… everybody has some BTC, right? Even if it’s just ₿0.001, add it here—it takes seconds to do it. Alerts: The Watchlist makes it easy to see your coins at a glance. However, you don’t need to check the app all the time. You can just set alerts. They’re useful to know when BTC spikes to $18,000 overnight, or when to sell that token that’s just had its ICO. Privacy: Simplicity is core, but we did not overlook privacy and security. Our server doesn’t know what and how many coins you own; all communication is done over https or wss (that’s “s” for “secure”). our analytics tracking is limited to only how you use the app (e.g. how many times you viewed your Portfolio, but NOT what it contains); we use data encryption features built into iOS. Read more about how we strive for Privacy And Security Without Compromise, in another post. It is only for iOS at the moment and we have no plans to work on an Android version. We do, however, intend to integrate it with the Apple ecosystem: on your wrist, on your iPhone, your iPad, and even on your TV. More charts, so you can view your coins’ price history and how your portfolio has changed over time. Multiple portfolios, so you can e.g. keep your serious investments in one and your hobby investments, or tokens, in another. A widget to view your Watchlist quickly, without opening the app. iPad, Mac, Watch, and TV apps, so you have access everywhere. Syncing between devices—your data always stays with you. You can’t add transactions, calculate any profit/loss on coins, connect to exchanges, import transactions automatically from blockchains, differentiate between mining and other income, and so on. These (and tons more) are all features we took into consideration and decided that the best option is to build Zenith Portfolio for crypto aficionados. We’re planning to build another app for advanced traders. We’re still looking for iOS beta testers. Get in touch with us or join here and we will give you access in TestFlight right away. Follow us on Twitter to stay updated, and don’t forget to HODL! There’s a new portfolio app in the block.